For years, I thought I had arranged things so I would never be bothered by statistics. I thought I didn't like statistics. But even though I didn't use statistics, I was reaping the benefits of data analysis in the form of more reliable and safer products. You are too. In fact, right now you certainly have items in your home that have been made better by the application of Minitab Statistical Software. One of the great things about working here is learning how companies use our software to improve items that we often take for granted, even though we rely on them every day. I recently learned how a leading provider of faucets used Minitab Statistical Software to achieve its continuous improvement goals. When they began making a new line of faucets, the entire workforce at this company's manufacturing site was eager to improve the speed and quality of their processes. When employees found a faucet that didn’t pass their strict quality standards, they used a rework process to ensure it didn’t reach consumers. But production was slow because of the number of faucets rejected. To make enough faucets, employees were working demanding overtime schedules. The company wanted to reduce the amount of rework and strenuous overtime for employees, decreasing operating expenses and boosting employee morale. When quality engineers used Minitab Statistical Software to analyze test data for pressure decay failure (PDF) in the new faucet, they discovered the faucets were up to 11 times more likely to fail with components from the first two assembly stations. They also identified 3 parts that were most likely to be responsible for the failures: the hose top, the hose bottom, and the end piece insert. Now the team needed to identify which part, or factor, was primarily responsible for the low pressure decay readings. They couldn’t get that information from the data collected in their initial quality test, so they used the Design of Experiments (DOE) tools in Minitab. In statistics, DOE is the creation of a series of experimental runs that let investigators change more than one factor at a time, and then use statistical analysis to determine which are important and even identify the optimum levels for these factors. Because DOE reduces the number of experimental runs it takes to test multiple factors, it’s an efficient and economical way to improve any process. To evaluate the 3 factors, the engineers selected low and high settings to test for each part and used Minitab to create a 3-factor, 2-level full factorial design, in which faucets were evaluated under 8 different experimental conditions. They replicated the experiment 4 times to increase their ability to detect a significant difference if one existed, then tested the faucets they’d produced. Finally, they used Minitab’s DOE analysis and visualization tools to quickly make sense of the results. A simple main effects plot clearly revealed that the hose top was the biggest contributor to pressure decay rate. Specifically, the low level hose top setting was most likely to cause low pressure decay rates. The same results, illustrated by an interaction plot, also showed that the effect of the hose top on pressure decay rate was significant regardless of the combination of hose bottom and end piece insert the employees tested. The interaction plot makes it easy to see that the effect of the hose top is present, no matter which other part settings are used. The analysis demonstrated that the hose tops with mismatch often fit poorly and were a significant contributor to the pressure decay rate. These graphical and numeric results helped the company explain the problem to their suppliers. When the suppliers improved the consistency of the hose tops, productivity increased significantly. Improving the hose tops was the first step. 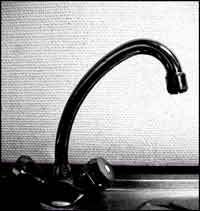 The employees then pursued a similar course of experimentation that showed that the material that made up the bottom hose plugs also had a significant effect on the quality of the faucets. By the time the employees finished making changes based on the experiments they designed with Minitab, productivity had increased from 65% to over 95%. The increased productivity led to annual savings of $500,000 and the company says employee morale has never been higher. Pretty cool. But now it's hard for me not to think about statistics every time I get a drink of water!